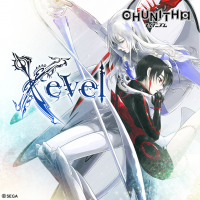 Xevel is part of Tatsuya Shimizu's "X" series of songs along with Xepher from beatmania IIDX 12 HAPPY SKY, Xa from 太鼓の達人 キミドリVer., and Xand-roid from GROOVE COASTER 4 STARLIGHT ROAD. A remix of Xevel by Nhato appears on Tatsh's エインヘリャルの蝶と異世界幻術姫 album. This song has different backgrounds, banners, jackets, or other related images. For more information, please see this page. Xevel originates from SEGA's arcade game, CHUNITHM STAR. It was featured as the Block Tournament song of the CHUNITHM division for the Tenkaichi otogesai Zenkoku issei nintei taikai 2017 (天下一音ゲ祭 全国一斉認定大会 2017) event. Xevel was crossed over to SOUND VOLTEX IV HEAVENLY HAVEN, TAITO's GROOVE COASTER 4 STARLIGHT ROAD, and BANDAI NAMCO's 太鼓の達人 ブルーVer. for machines in AOU arcades on October 25th, 2018, as a Qualifying Round song for the Tenkaichi otogesai Zenkoku issei nintei taikai 2018 (天下一音ゲ祭 全国一斉認定大会 2018) event. It was added to all SOUND VOLTEX machines on March 15th, 2019 in SOUND VOLTEX VIVID WAVE. Xevel marks Tatsh's debut in the SOUND VOLTEX series. It also marks his first appearance in BEMANI in five years, his last appearance being 蒼天 in jubeat saucer. Xevel's MAXIMUM chart stops scrolling briefly and shows the "X"-shaped knob pattern before the song ends. This is a reference to Xevel's MASTER chart in the CHUNITHM series. Xevel also appears in SEGA's maimai MiLK PLUS. Xevel's effector credits, 浮世チュニーン, is a combination of 浮世マシーン and "CHUNITHM". MAYA is uncredited in Xevel's jacket credits, and is credited as "SEGA" instead.